What does iMedicine Review offer during the Live course? The live course covers every subject of Internal Medicine from basics to complicated scenarios. Differential diagnosis and management is discussed in a stepwise approach. The course binders will be given to you at the course which you can revise later for your exam. The sessions are very interactive. Hundreds of MCQs with explanation of each choice will be discussed and numerous clinical and radiological images will be reviewed. We provide you all the updated and essential information you need to know to pass your exam. Why iMedicine Review is the course to take? 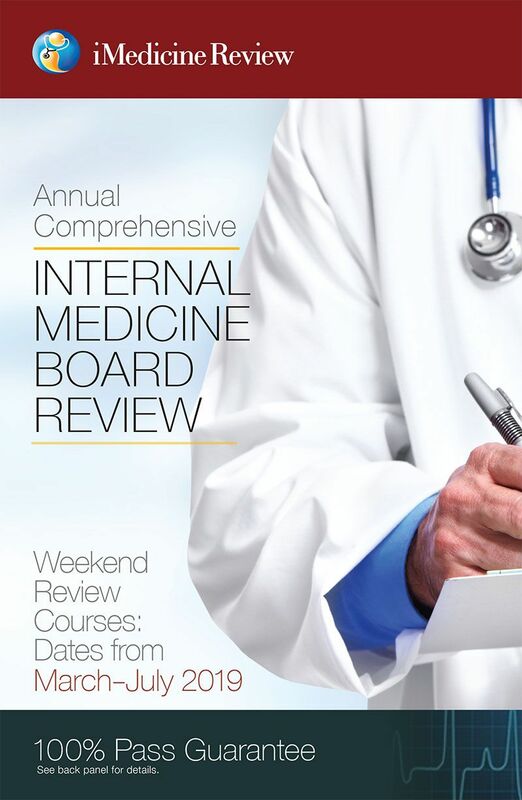 Our success rate has been excellent for the ABIM Internal Medicine Board Exam in last 12 years, better than many long and expensive courses. The course is available at unbeatable tuition fee. The review is being held in various cities in 2019. You can pick any of the sites for participation, and based on availability, can also pick more than one site if your schedule does not allow you to attend all the days at one site. We have significantly raised the pass rate of many residency programs. Does iMedicine Review offer anything besides the course? Yes. 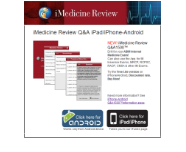 In addition to our live courses, iMedicine Review has created course App on iPad with selected course material, and Q&A1500™, with more than 1,500 questions as iPhone/Android applications (purchase required). The online versions are FREE with your paid course registration. The smartphone and online questions and answers let you prepare for the course any time you want. Why should I take the live course if I can study the selected course online or via iPad App? The live course offers much more than the Full course available online or via iPad App. Hundreds of additional questions, exercises, mix & match questions and images are discussed. The live courses give you a chance to dedicate your time to study for the Internal medicine exams in very interactive sessions. The live course is intense but very comprehensive and is very high-yield. Click on the Register by mail link. Fill out all the fields in the form, print it, and mail it with a check for $795 (or discounted rate if applies) to: iMedicine Review, 1268 Meadowbrook Road, Lancaster PA, 17603. Email confirmation will be sent to registering residents and physicians upon receipt of the application form and payment. When we receive your application (via mail or online), it takes up to 2-3 business days for completion of registration process. The password will be included in the email confirming your registration. The password is provided to you for your paid registration and should not be shared. You will have access to the Q&A’s till your exam. Click on the Register online link. On next page from the course options, click the one you wish to attend. On next page from drop-down bar “Click an option”, select the payment that applies to you and fill the registration form below it and then hit submit. This leads to next page where it will ask Pay via PayPal or Pay via your Debit/Credit cards. Select your payment choice to go to the next page for filling credit card info and then submit. Can you suggest additional reading or preparation? Yes. Although we offer online course and >1500 Q&A’s online and hundreds of additional Q&A’s during the live courses, you can also practice with MKSAP 17 self assessment test. Other good resource for board preperation is Knowmedge online Q&As bank. During the live course numerous clinical and radiological images will be reviewed, however you can do additional study with Atlas of Internal Medicine by Braunwald. Yes. If you cancel up to 14 days prior to starting the course we will refund the balance of your tuition fee after deducting a $100 processing fee. There is no refund for cancellations within 14 days of the course. A written notice is required by email for cancellations. Yes. We give 100% pass guarantee. If you fail your ABIM exam you can participate in our course again at no charge. To take advantage of our guarantee, simply send us written verification from ABIM of your test result. Please note that our results are better than many long and expensive courses.